And the earth was without form and void, and darkness was upon the face of the deep, and the Spirit of God moved upon the face of the waters. 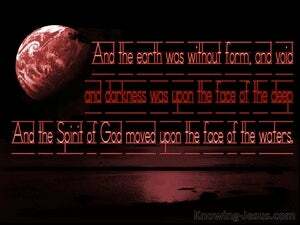 And the earth was desolation and emptiness, and darkness over the face of the deep: and the spirit of God moved over the face of the waters. Now the earth was formless and empty, and darkness [was] over the face of the deep. And the Spirit of God [was] hovering over the surface of the waters. 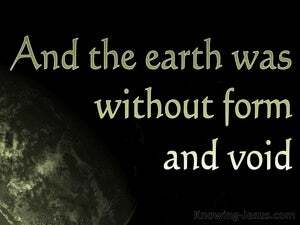 And the earth was without form and empty. And darkness was on the face of the deep. 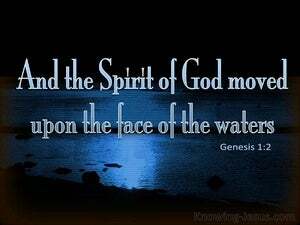 And the Spirit of God moved on the face of the waters. The Earth was void and empty and darkness was upon the deep, and the spirit of God moved upon the water. 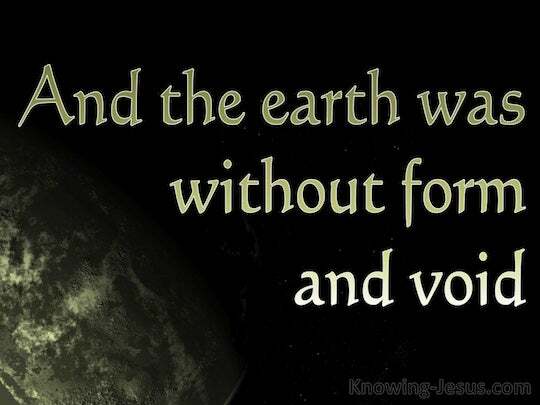 1 In the beginning, God created the heavens and the earth. 2 Now, the earth, had become waste and wild, and darkness, was on the face of the roaring deep, - but, the Spirit of God, was brooding on the face of the waters, 3 And God said - Light, be, And light was. Lo! these, are the fringes of his way, and what a whisper of a word hath been heard of him! But, the thunder of his might, who could understand? Who hath measured, with the hollow of his hand, the waters. Or the heavens with a span, hath meted out, Or hath comprehended, in a measure, the dust of the earth, Or weighed, in scales, the mountains, Or the hills, in a balance? Emptiness, yea turned to emptiness, aye deserted is she ! with, heart, unnerved, and, a tottering, of knees, and, anguish, in all loins, and, the faces of them all, have withdrawn their colour.